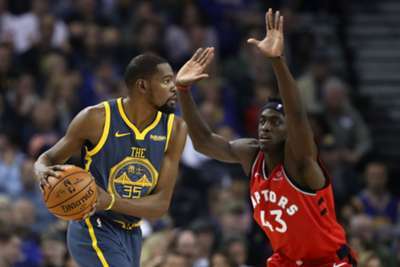 Kevin Durant said the Toronto Raptors are a force to be reckoned with after they beat the Golden State Warriors for the second time in the space of a fortnight. The Raptors saw off the Warriors in overtime at the end of last month and defeated the champions again on Wednesday, winning 113-93 at Oracle Arena. Nick Nurse's side are 23-7 at the top of the Eastern Conference and Warriors star Durant says they should be taken seriously in the battle for the NBA title. "They have champions over there," Durant said. "Danny [Green] and Kawhi [Leonard]. They also have guys like Serge [Ibaka] and Kyle [Lowry] and Jonas [Valanciunas]. "They got a great mix of veteran and young players. They got a new coach, but the leaders of that team have been through some wars. "So I wouldn't call them a young team or say them beating us two times is going to give them extra confidence. They've been ballin' before that, and they're going to be ballin' after they beat us. "So they're not an up-and-coming team. They're here." Warriors head coach Steve Kerr felt his side lacked intensity, but refused to be too critical. "We're now in a place where we're defending a title and defending sort of a mantle that we've had for several years, and it's a different vibe," he said. "It's a different feeling than when you're on the climb like Toronto is, like Milwaukee [Bucks] is, like we were a few years ago. It's a different feeling, it's a different vibe. "It's harder to get up for each game, and so there are certain nights where you can just feel it, you don't have that energy, and if you played in the NBA, you've coached in this league, you understand it. "If you've followed it closely, you understand that. It's not an excuse, it's just reality. So we did not bring the required energy."